BERKELEY, CA--(Marketwire - February 1, 2011) - Leading 3D component provider Tech Soft 3D (TS3D) today announced the availability of HOOPS 3D Framework™ (HOOPS 3DF) v19. This newest release features enhancements driven by the hundreds of commercial engineering software teams that rely upon its proven graphics technology to make their applications successful. "HOOPS 3DF v19 was developed with the future in mind. We've spent a great deal of time paying attention to both what our customers require and the direction of the graphics industry," said Gavin Bridgeman, Vice President of SDK Products. "This has given us the ability to incorporate some leading-edge features in version 19." View a video demonstration that highlights some of the latest capabilities of HOOPS 3DF. HOOPS 3DF is a high-performance graphics framework used within applications from engineering software companies such as Autodesk®, Solidworks, PTC, MSC.Software, ANSYS®/Fluent, COADE, Siemens PLM Solutions, Mitutoyo, IronCAD and 300+ others. By leveraging the robust set of HOOPS 3DF libraries, software teams are able to develop high-performance, visually-rich applications and get those applications to market quickly and cost-effectively. Find out more about HOOPS 3DF and its capabilities or download an interactive HOOPS MCAD demo. Tech Soft 3D provides premier component technologies and related services that enable software developers to rapidly create world-class technical software. The company's flagship HOOPS 3D Framework has been incorporated into nearly 300 commercial software applications. 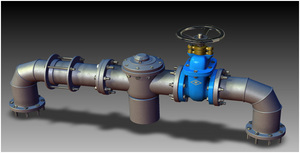 Tech Soft 3D also develops HOOPS 3D Exchange and resells premium components such as Autodesk's RealDWG® Toolkit and AutoCAD OEM platform, and Parasolid® Modeling Kernel from Siemens PLM Software. The company maintains corporate headquarters in Berkeley, California and can be reached through www.techsoft3d.com.